Lock in a great price for Black Jack's Mill – rated 8.8 by recent guests! The property, although hard to find was worth the drive. In the bottom of a valley with a canal, trees and wildlife all around, it was hard to imagine you were only 5 miles from the M25. Awesome location!!! Stunning views!!! The parkland behind the building made for an interesting pleasant walk. Lovely hosts who were very accommodating. I often leave early for work and often before breakfast starts. The staff were very kind and cooked me up a bacon sandwich which was much appreciated. Lovely location too. Comfy bed, very quiet and ideal if you want that kind of thing. I was there mainly for work but the canal side and riverside location is very pleasant. I'd stay again if I was in similar situation for work. What a lovely hidden gem! Beautiful and quiet location. Our room was overlooking the lake and the canal. We saw a heron and a crane looking for fish. Very short walk to a very good pub The Old Orchard. This is a calming and charming place to stay. Breakfasts are exceptional. The staff are genuinely very friendly. The old mill has real character but the settings are where the scores are best. Needs a little more tlc to recover from decades of neglect although would happily stay over any time. location was amazing. its a little oasis with water all around. Nice welcome and clean room. The area is lovely next to the canal, and a short walk along the towpath too the "Coy Carp" pub, which sell lovely reasonable priced food and very friendly. The Old house is nice and interesting old building. Space for car parking. A former water-mill between the River Colne and the Grand Union Canal, Black Jack's Mill enjoys a tranquil setting in Harefield. Just 12 miles from Heathrow Airport, it provides elegant rooms with free Wi-Fi and parking. Black Jack's Mill offers a variety of rooms and suites, some feature an private bathroom and others include access to a private bathroom or shared bathroom. All have a TV and tea and coffee facilities, and views of the river and gardens. Uxbridge, Colne Valley Park and the Pinewood Studios at Iver Heath are all within a 15-20 minute drive. The towns of Ruislip, Northwood and Rickmansworth are all within 10 minutes of Black Jack's Mill. This property also has one of the top-rated locations in Harefield! Guests are happier about it compared to other properties in the area. This property is also rated for the best value in Harefield! Guests are getting more for their money when compared to other properties in this city. When would you like to stay at Black Jack's Mill? This room looks out onto Black Jack’s Lock and has a 40-inch flat screen Smart TV, private bathrooms and tea/coffee-making facilities. This attic double room overlooks the Grand Union Canal and has a 24-inch flat screen Smart TV, shared bathroom with only one other Attic room and tea/coffee making facilities. This room offers views of Troy Lake and has a TV, an en-suite shower room and tea/coffee making facilities. This suite features views of the surrounding lakes and has a smart 43-inch flat screen TV, private bathrooms and tea/coffee-making facilities. In this room an additional single bed can be added at an additional cost of GBP 25. This suite overlooks the Grand Union Canal and has a 43-inch flat screen Smart TV, seating-area, private bathrooms and tea/coffee making facilities. An additional single bed can be put in this room for GBP 25. 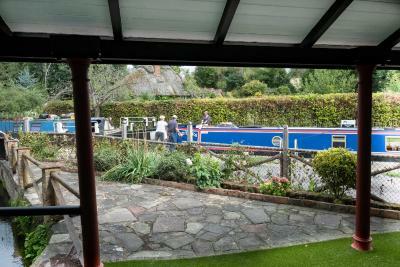 This double room overlooks the Grand Union Canal and has a 40-inch flat screen Smart TV, private bathrooms and tea/coffee-making facilities. This attic double room overlooks the Grand Union Canal and has a 24-inch flat screen Smart TV, shared external bathroom shared with one other Attic room and tea/coffee making facilities. House Rules Black Jack's Mill takes special requests – add in the next step! Black Jack&#39;s Mill accepts these cards and reserves the right to temporarily hold an amount prior to arrival. Black Jack's Mill accepts these cards and reserves the right to temporarily hold an amount prior to arrival. Please note that only an extra bed can be accommodated within the Luxury Suite and the Deluxe Suite. Please inform Black Jack's Mill of your expected arrival time in advance. You can use the Special Requests box when booking, or contact the property directly using the contact details in your confirmation. 1. The carpet was still wet from being washed to get a coffee stain removed from previous occupants. This soaked my socks when I stepped on it. 2. The price of £135 compared badly with what I paid the same night last year, ie £75 for the same room. The shared bathroom was okay as it was only shared between 2 rooms. No big deal but the shower situation was not what I was expecting. I had a bath instead but still a stand up shower is fairly standard. Final road access to property : very steep, narrow and must be a nightmare in case of ice and/or snow. But the B&B at the end of that road is definitely worth the effort ! This is a very unique bed and breakfast. It is full of character. My room, Lake View, was very small but had a lovely view and was warm and comfortable and I slept very well. The hostess and staff were friendly and polite and, I suspect, would have been very helpful if needed. The property is accessed via a private drive which goes downhill for about a quarter of a mile and has a very hump-backed bridge at the end! The noise of water in the mill race is spectacular. I was travelling for work and there was no table to sit at in the room, but as I had an evening meeting it wasn't too much of an issue and there were areas to sit with sofas on the landing. My room had uneven floorboards, which are a bit of a pain if you haven't brought slippers! Again, not a big issue. The en-suite was chilly and a little tired and the shower didn't stay at the same temperature all the way through but it was clean and perfectly functional and had nice toiletries. Couldn't find a hairdryer. It was expensive for one (£90) but I think it was the same price for a couple so would have been very good value for two. Lake View bed was a small double. Tiny room and very small ensuite so a bit pricey for the accommodation as there was nowhere to sit and relax. Lovely cooked breakfast. Great location. The breakfast opted for the continental had to decide the night. The coffee was fine then a choice of cereals a then toast and jam. after enjoying Premier inn breakfast it was dissapointing. The bathroom was extremely small and very cold. The bed was rather lumpy and uncomfortable. There were no basic facilities in our room such as a hairdryer. The furniture and bed were tired and it all seemed to be mismatched. The location right by the river. The staff, who were friendly. The breakfast.